When we last left Bayou Fountain, this was the scene. 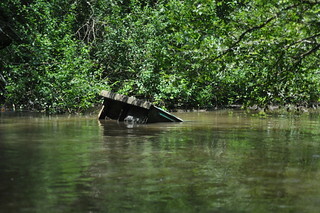 One old decrepit portapotty, hereafter referred to as “the loo”, yet remained in Bayou Fountain. 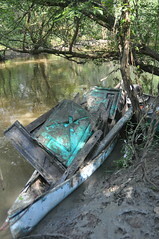 The location was mapped, and the condition was noted. The mission was a go. Early Sunday morning, Mike and I arrived at Manchac Park with an unusual gear load out. We had the hand winch, saws, prybar, hammers, a sledge, rope, straps, plenty of beverages, and even a hatchet. 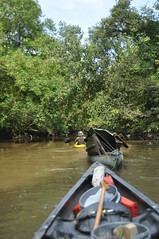 Oh, and considering the size of the objective, we were not in one canoe as usual. In fact, we weren’t even in *two* canoes. No, we had a fully-fledged paddle train going. I was in my little yellow kayak. Following behind on a line was the cargo canoe. 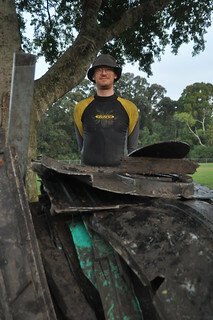 And of course, tied off to the stern of the cargo canoe was the gear canoe (complete with Mike). We put in at Manchac Park and headed upstream. The water was still higher than normal, but it had come down a bit from where it had been. There was a notable current, but it wasn’t *too* bad to paddle against, even as the engine to a three-hull paddle train. (I was making about 2.5 mph, plus or minus.) 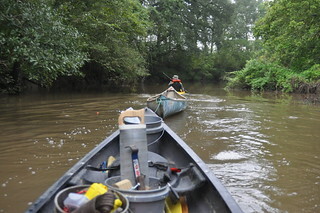 About 0.8 miles upstream, we came to the confluence of Ward Creek and Bayou Manchac. It was full of litter, as usual. The current slacked off some after Ward Creek, and with Mike taking some of the load off, the paddle train was making nearly three miles an hour for a bit. There were a few obstructions, including one not quite half a mile upstream of Ward Creek, but they weren’t that bad with the water as it was. 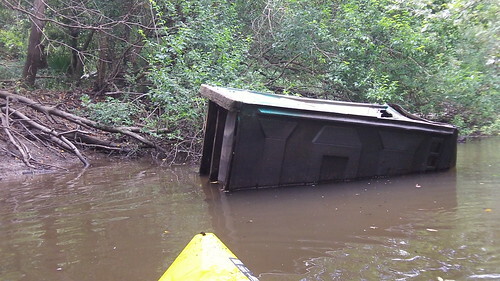 Once we got on Bayou Fountain, there were several significant sets of floating logs to pass, but a bit of work made it through. Finally, we sighted the objective (looking to be in a bit deeper water than the previous recon). We put ashore and started the recovery portion of the operation. Did I mention that the mosquitoes were out in force? Nothing could stop them, but neither could they stop us, although they did turn the day into a bit of unexpected (but worthwhile) misery. We recorded some video this time, selected clips from which are here for your skimming pleasure (feel free to fast-forward or ignore — it *was* a long and rather uninteresting day, hehe). Eventually, we made it back to the launch point at Manchac Park. Unloading everything up the steep bank and pulling the boats up was something, but getting everything back to the parking lot was something else entirely. We managed to finish right as the daylight was failing us, and with all three boats loaded, all the gear packed away, and the remains of the loo stacked against a rail by a trash can, we paused for one parting shot. 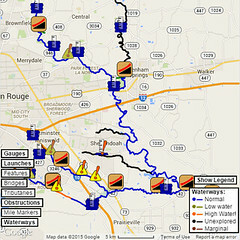 ← Welcome to Paddle Baton Rouge! Impressive job! 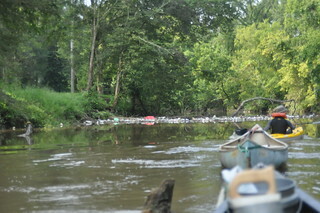 Thanks for cleaning up the bayou.